Presbyterians in Pittsburgh – 333 vs 331 – is there a clear winner? The issue is, who wins when the outcome is 333 versus 331 in favour of not divesting from companies that profit from Israel’s illegal occupation? Only one vote made the difference (a tie would have gone to considering the divestment option). One woman announced that she had accidentally voted against divestment, but by then it was too late. 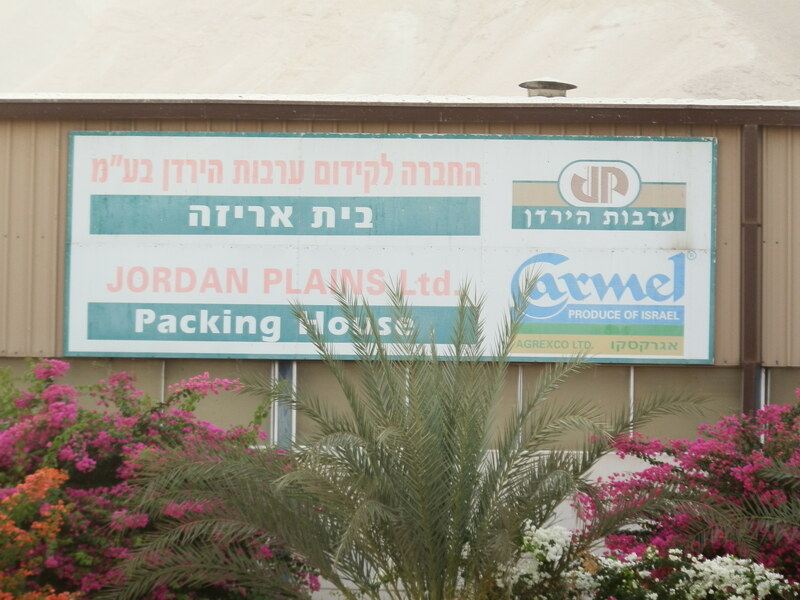 I took this photo in the Jordan Valley, in the West Bank, which is not in Israel. On boycott, the committee decided that boycotting only Ahava and Hadiklaim wasn’t enough. They amended the overture to include boycott of “all Israeli products coming from the Occupied Palestinian Territories,” and calling on “all nations to prohibit the import of products made by enterprises in Israeli settlements on Palestinian land.” The overture passed in plenary by 71%. I truly believe that both sides, both parties that emerged divided on the issue of divestment, act in good faith and are driven by good intentions in working for peace with justice in Palestine and Israel. The problem as I see it, however, is the fact that they differ in the depth of their understanding of the situation on the ground. They also differ in their ability to withstand the tremendous intimidation and numerous threats posed to them by Zionist lobbies and right-wing Christians. They differ, finally, in their proposals for peace in our region. The “minority” camp, responsible for the divestment motion, generated a clear proposal based on the fact that the conflict’s two sides are not equal. Israel is the powerful party and systematically imposes its will on the weaker party. The minority group also knows that time is running out for peaceful solutions and that the war drums are already resounding louder than their own voice. In 1991, when the “peace process” began, there were around 70,000 Jewish settlers in the West Bank, many of whom expressed willingness to move back to Israel if peace prevailed. Today, about 600,000 settlers live in the same area, and they are more radical, more aggressive; they are running not only the settler movement, but also the state of Israel as a whole. Conditions for peace, then, are worsening, and the clock is ticking. I sense that the minority camp within PCUSA understands this, and knows from both sides of the conflict that there is no time left. Palestinians tell them that there’s no more land for their children to build houses on and cultivate their crops; they fear that, if the settlements and the wall continue to uproot their olive trees, there will be none left to even offer branches to the Israelis when peace comes. The conscious Israelis tell them that the occupation has corrupted their people: their society is moving rapidly to the ultra-right, and the distinction between left and right is blurring. Many Israelis tell them that they are growing poorer, with the government’s repeated insistence on building settlements in the West Bank including East Jerusalem while ignoring problems of housing and unemployment in Tel Aviv and other cities. These conscious Israelis tell them that they are ashamed of how their government and society deal with the Palestinians and how they deal even with none political issues like African migration to Israel, beginning to deny migrants admittance even to hospitals . . . these Israelis tell them that not only diplomatic peace is at stake, but also their own values, their principles, their belief in human rights and democracy. The PCUSA minority party built their proposal on harsh, urgent realities such as these — and on ethics and international legitimacy, including international laws and UN resolutions. They understand that some economic pressure on Israel and its supporters is necessary if peace is to prevail. In contrast, the “majority” party did not have a clear proposal. They root their arguments in vague proclamations like “Both parties are equally responsible for the deterioration of the situation” and “Both parties need to sit down together and talk until a peaceful settlement is reached.” As Israeli peace activist Uri Avnery once said, they want the mouse to sit beside the cat and discuss what they’re having for dinner. They ask why Israel is being “singled out” for criticism when many Middle Eastern countries abuse human rights on a regular basis. They express their concern about relationships with Jewish communities in the US and elsewhere, fearing that these relationships will be damaged if PCUSA were to take any measures without their approval. They focus their concern, moreover, on those Jewish communities administered by Zionist lobbies rather than listening to the other Jewish voices: the voices that say, both from within Israel and abroad, that Israel must be pressured to lift its oppression of the Palestinian people and respect its obligations under international law. The majority party fails to address Palestinians with respect to what they should do and how long they should wait until Israel turns to them and agrees to the concept of “live and let live.” They fail to see that the two-state solution — widely accepted by all countries, including the US — is vanishing as a viable possibility, as soon there will no longer be any land for the Palestinians to build anything, even tents, for their children. They fail to communicate exactly what they mean by “singling out” Israel: that Israel does abuse human rights, but that they reject focusing exclusively on its violations? That because most countries in the region are human rights abusers, Israel should not be criticized? They also fail to tell us how “positive investment” is actually going to bring about peace in the region. In this spirit, I wrote earlier that justice was the primary winner in the PCUSA General Assembly. But I believe that the Palestinians emerged as winners, too. They gained strong friends and supporters among the 331; they also gained an audience with the 333, who likewise grew in their understanding of the underlying problems and of the Palestinian narrative. Their vote for a complete boycott of Israeli settlement products shows that their support for Israel is conditioned; it is neither blind nor absolute. […] I would like to extend an invitation to this party to come and visit us in Palestine, where they will be met with warm hospitality and our commitment to show them the pure reality on the ground. I have no doubt that, with their strong commitment to justice, they will see and be transformed. Finally, I pray for both camps within PCUSA. I pray for the 331 members: I pray for God to give them the strength to keep up their struggle for their faith and their values, the strength to keep walking with God. I also pray for the 333 members: I pray for God to open their eyes so that they can see what they have failed to see thus far, and I pray that they will have more desire to come and see the truth as it exists. And to see both of us, Israelis and Palestinians, in our respective contexts and realities. I pray, too, that God will give them the wisdom to come up with a clear, bold, peaceful proposal that might help us avoid falling once again into war and bloodshed. I pray that God will give us all the courage to see the truth and act accordingly.